Use the Design view to create a hardware system that you can document and share. The Design view palette includes devices on the Live diagram and NI hardware you can use to create a system. The devices that appear on the Design view palette depend on the instrument drivers you have installed. A device on the Design diagram is similar in appearance to the same device model on the Live diagram and contains several configurable features. Label—A text field you can edit to label the device on the diagram. By default, the device label matches the device product family. Sub-label—Additional information about the device, such as the device name, hostname, model, or product family. Software—Applications that execute on the device and libraries that contain reusable source files. Device slots—Controllers, modules, and empty slots. Match status icon—Glyph indicating if the device matches a device on the Live diagram. Click an empty device slot to open a palette containing every device you can add to the slot. A blue dot on a palette item indicates that the device has a match on the Live diagram. The Sync setting on the Design view document toolbar determines if you can apply changes in your project to live hardware in your system. Sync is set to Enable hardware matching when you open the SystemDesigner project document for the first time. Not Matched (Hardware matching disabled) When Sync is set to Disable hardware matching, SystemDesigner prevents devices on the Design diagram from matching with hardware in your live system. Not Matched SystemDesigner does not identify a corresponding device on the Live diagram. Partially Matched SystemDesigner identifies a potential match on the Live and Design diagrams. Click Update modules in chassis to update the device on the Design diagram to match the configuration of the device on the Live diagram. 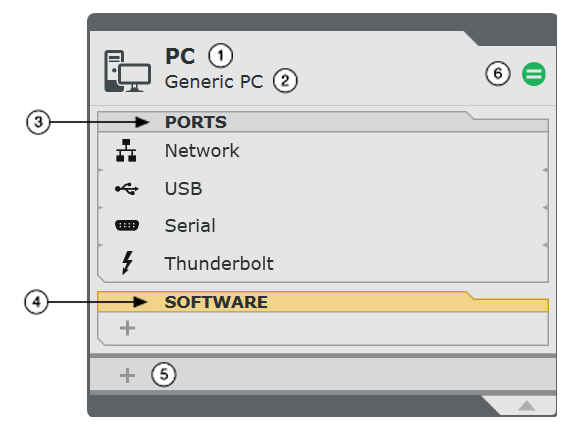 Matched SystemDesigner identifies a corresponding device on the Live diagram. If a device on the Live diagram does not have a match on the Design diagram, the device appears on the Unplaced Live Hardware palette. You can place every device from the palette onto the Design diagram at once, or you can select specific devices to place. When you add a device on the Unplaced Live Hardware palette to the Design diagram, it has the same configuration as the matching device on the Live diagram. However, devices on the Design diagram do not change when modifications occur to a matching device on the Live diagram. Additionally, SystemDesigner does not remove a device from the Design diagram after you remove the matching device from the Live diagram.